Visiting a Bangkok red light district in 2019 is still very entertaining for single male travelers. This city can be a bit intimidating and time-consuming to figure out where everything is. In this guide the goal is to get you familiar with the best hot spot areas in Bangkok, and to give you a good idea of the prices in the bars. It is also important to know that these areas are really entertainment spots, and not what you would consider a traditional red light districts. It is somewhat like Las Vegas in this regard. You will see that there are singles, couples, and sometimes even families in and around these areas (especially Patpong). The three best red light areas in Bangkok are carefully catered to foreigners, and you will find all types of tourists from all nationalities. In comparison to other cities, you will see that most foreign oriented areas have tons of tourist from all over the globe. After reading this guide you will know exactly where to go for the best entertainment this great city has to offer. The 3 main areas to know are Nana Plaza, Soi Cowboy, and Patpong. From end to end, the red light districts in Bangkok are around two and a half Kilometers away from one another. Each red light district has its own vibe to it and is special in it’s own way. After some time you will know how to have fun in each of them. I will describe it in each section below. I will also tell what to expect for the prices for drinks and more. Compared to Pattaya the prices in Bangkok a bit higher for pretty much everything. Although not by that much these days, but still enough that some people would rather spend most of their holiday in Pattaya because of the lower prices. Just expect prices to be slightly higher in these areas for food, hotels, drinks, etc. Meeting nice friendly Thai women online is huge now in all cities in Thailand. Many guys are realizing this fact that it can be convenient to meet them online, rather than always going out, socializing and doing it the old school way. And keep in mind that many of the women feel more comfortable using a site to meet foreigners than actually doing it in person. You can meet all types of women there, and find someone that matches your type. Use my Thai Friendly Guide to understand how everything works online. There is very useful info there. Another tip is to book hotels that are guest friendly in Bangkok. The best is to book the ones close to the red light areas. These hotels do not charge you extra fees if you bring back a friend visitor to your room. This can be useful since you will most likely meet new people and want to hang out with them back at your hotel. Located in Sukhumvit Soi 4, Nana plaza and the surrounding area is Bangkok’s largest red light district. There are around 30-40 gogo bars, beer bars, and other entertainment venues within Nana Plaza. In the outside areas there are more beer bars and freelancers. What is distinct about Nana plaza is that it is three stories high and has a courtyard style design in the center of it with more bars. Expect to see lots Thai women around since it is a well-known touristy area. Also don’t be surprised if you run into a few Ladyboys since they are well accepted in society here. For some daytime fun it is great to check out the bars just outside Nana Plaza. They usually have good food, pool tables, and you can relax and watch the scenery. Bangkok has freelancers and they work in and around all 3 main red light districts. Check out the article on Thai bar girls here Just like Soi Cowboy, Nana plaza is very simple to get to using the Sky Train System (BTS). Exit at the Nana station and it will be around a 5 minutes walk heading north-east. Read more on the Thai girls here. And if you are interested to know about my mindset and game, then check out my book. Bangkok’s next red light area has a name you will remember: Soi Cowboy. It is about 1 km away from Nana plaza between Sukhumvit Soi 23 and Asoke is Soi Cowboy, which is a small side street about 150 meters full of gogo bars. It is easily one of the top red light districts in the world. You can’t miss this place the whole street if full of neon and florescent lights. And even in the low season it can get busy on the weekends. You will also find some nice massage shops on Sukhumvit Soi 23 just outside this area. The girl hostesses here are very attractive. Drink prices here used to be a bit cheaper than Nana, but these days they are pretty much the same. The Bangkok gogo bar prices don’t present much value to be honest. They have the highest drink prices in all the city. In the high season it gets jam-packed every night. Generally speaking Soi Cowboy could be the best red light area in Bangkok The prices remain the same during low season, but they won’t be as busy. Some people prefer to travel during those months. The BTS station to exit in order to get here is called Asoke station. After exiting is just a minute walk to get to this place. It can be argued that Soi Cowboy is the best red light district in town because it has some of the best gogo bars in all of Thailand. I like them all, but my personal recommendation is that if you are in Bangkok for a short period of time and looking for only one place to check out I would recommend coming here. 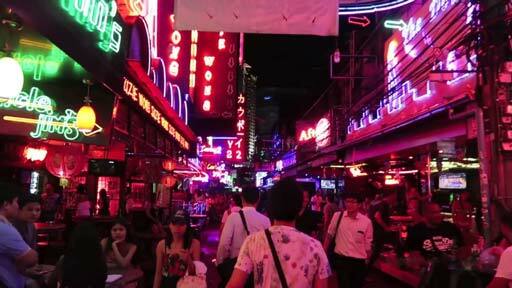 Located south-east of Nana plaza, Patpong is Bangkok’s oldest red light district. 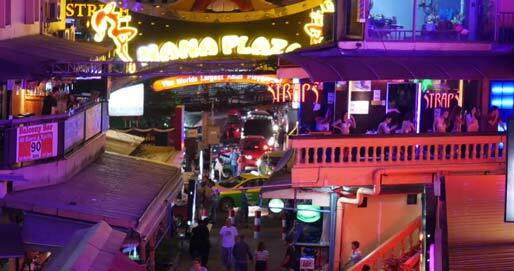 Patpong is really also a night market which caters to all types of tourists. In order to get here you will need to use the subway line (MRT) and exit at Silom station. You will not find the same type of flash and in your face type rush as with the other 2 locations, but it is still worth a look whenever you are in town. Especially for the nostalgic aspect of it, since it is also a night market filled with vendors selling all sorts of things at low prices. This place use to have a good ping pong show where the ladies perform very interesting acts, but recently I would not recommend that here at all as there is a high chance of scams and over paying for drinks and other charges. My recommendation is to check out all of the areas mentioned in this article. Then after you can come up with your own conclusions and opinions about it. Everyone is different and has their own perspective on things. If you are new to Bangkok and want to enjoy this city as fast as possible, then refer to this guide to help you along. I like to enjoy them all as I can recognize what each area has to offer and I enjoy it for what it is. For example, I like the way Nana plaza is set up with three floors and the countless gogo bars I can explore and for the sheer thrill of the entertainment. Also there are some super hot Thai chicks working there. Sometimes I just like to go for a couple of drinks and check it out but not necessarily try to meet and women there. I like the way Soi Cowboy has bars on both sides and I can check out all the scenery as I walk by. I like Patpong because it is a different vibe than the other two and I appreciate a change of scenery once in a while.